04/26/2012 – Spring has sprung here in Newport, RI! The shipyard has come alive with boats arriving daily from southern waters, and the shrink wrap has gone from the yachts that rested here all winter. Today we are launching our demonstrator M36, Inglesea, for the summer season. With a fresh coat of bottom paint and some light maintenance ahead of us, she will be ready for test sails by the weekend! We are very excited to have her on her mooring in Newport Harbor. We also have been busy installing our custom built office furniture. 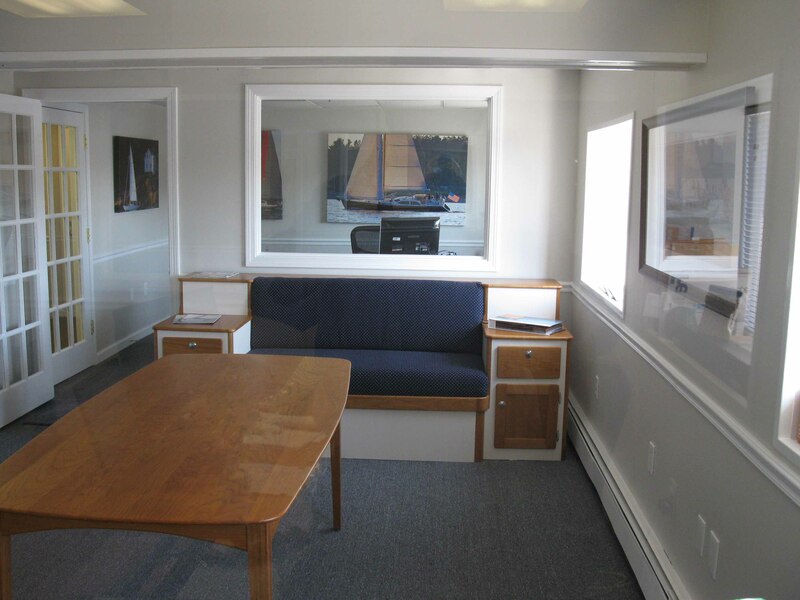 The guys in Maine have outdone themselves, and our new settee and office desks are the talk of the Shipyard. To add to that we have just hung all of our art work on the walls done by Onne van der Wal. Our office is truly looking “awesome” and we can’t wait for the upcoming grand-opening celebration. The word is spreading fast that Morris Yachts has come to town, and the reception has been great! Next week we will be hosting a sales meeting, and getting ready for our crew to deliver the latest M42! I can’t wait to see the boat; she will be living here at the Newport Shipyard for 2-3 weeks before she loads on Dockwise. I hear she is one of the prettiest 42’s we have ever built.